I saw this and figured Bisch had already spilled something this morning. Bump to the top, so everyone knows this one is started ! Hope I can add to the thread this year! Too dam cold!!! I will go out later this week once it becomes tolerable, especially since I am shooting out of tripods. I'm going to try again tomorrow, so cold before New Years the gates froze shut on me. Four wheeler was solid ice! My does are avoiding the Krivoman. Good luck i hope to add something this year after several year trad layoff!! I was doggone close to being the first yesterday. Had a doe at 17 yards and she never gave me a shot angle. Still trying, man it's cold! Does A Lost Pig Count? I shot a sow this evening. She was moving fast and reactions took over. I hit right where I was aiming, then realized that aiming spot was perfect for a deer, not a hog, right behind the shoulder. She acted sick while running off, but I never found a drop of blood other than on my arrow. I think I got back of lungs/liver/diaphram area. Dead hog, just not riding home with me. At least you poked one. Good job there. Funny you mentioned, perfect spot for a deer. I'm curious. If you hit the exact spot, where do you shoot? Hmm, good point... well I shouldn't have said perfect. It would have been 'good enough' for a deer. Right where I'd aim with a rifle though. With deer I like to go up from the elbow about 1/3rd of the way up when shooting with a bow. This was 3-4" back of that spot on the hog. In the heat of the moment, I'm afraid I rushed the shot, and just reverted back to my early days with a rifle. I'd say the green dot right here's where I hit the hog. Hoping to get on them when I get off a week from now! I’m heading out this afternoon so hopefully we can get it going with some LDPs. I have 1 buck tag left and ANY buck is on the hit list. Hopefully one of the many scrub bucks I’ve had right in front of me or one of the nice bucks I have on camera will show. Last edited by Featherflinger; 01-05-2018 at 08:24 AM. Come on Tuesday morning, I'll be home and in kill mode! good luck fellas. Blood makes the grass grow green. Happy 2018 Yall. Its gonna be fun. Way to go Byron! That's kicking things off right! Awesome Byron! All I got is doe tags so I hope to add one too! Congrats Byron. Trumpkin, I am a little surprised you did not find your pig if that is the spot you hit. I have made a few work out with pretty close to the same hit. Again not intentional, but it can work. I was pretty shocked myself. How can a pig take a 2" Treeshark through its middle and leave zero blood? I dunno... I got a good view of the first 40 yards of path it ran away on, and there was not a drop of blood. after that, all the game trails crisscrossed so bad, I resorted to grid searching, and trying to bump into it's lone piglet. Way to start it off Bryon! Way to go Byron! Congrats! Nice deer. That's how you start the year off right. I got a nice doe yesterday evening, but my phone is sitting at the ranch where there is no service, so it will be tomorrow or Monday before pics show up here! Way to go buddy, by the I'm out of honey! Congrats Bisch! You figure out what was going on with the longbow I take it? Way to Bisch, back in the saddle again! Congrats Jerry That is awesome news! Congrats Byron and Bisch!! I'm pretty much done bow hunting for the season, except pigs. Deer season closes her tomorrow for everything except muzzle loader and the late youth season. On the board for 2018, and all tagged out in Wise county with the Samick Sage! Darn nice p dot. Congrats! Bisch, you have been here long enough- "pics or it didn't happen." Way to go go p-dot! 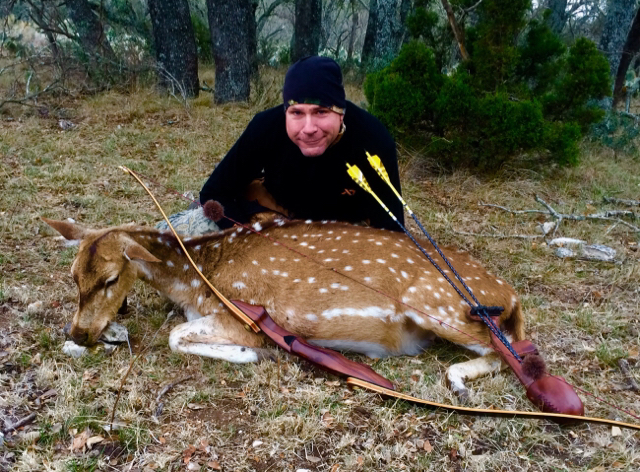 Well, after one of the most miserable hunting seasons I can remember, with blunder after blunder that convinced me to go out and buy a wheel bow, the last weekend of the season (but first of the new year) turned out absolutely awesome! I sure hope this past weekend was a sign of how things are going to go for the rest of 2018!!! Congrats to all who have been successful so far!!!!! Last edited by Bisch; 01-08-2018 at 02:32 PM.